The Ukrainian Foreign Ministry has said the arrest of lawyer Emil Kurbedinov in Russia-occupied Crimea is an attempt to deny the Ukrainian nationals whose rights he has defended the right to be defended. In connections with this incident, the Foreign Ministry has called on the international community to heighten pressure on Russia so that it would de-occupy Crimea and release all the Ukrainian nationals it has illegitimately been keeping in custody. "The charges of 'demonstrating the attributes or symbols of extremist organizations' used by the Russian occupiers' 'court' to throw Emil Kurbedinov behind bars are groundless and fabricated. 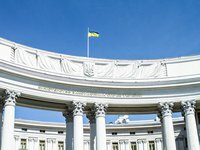 In fact, Russia is trying to deprive Ukrainian citizens—political prisoners in the Russian Federation and in the occupied territories—the right to defense by intimidating and harassing those who support the Ukrainian hostages of the Kremlin and protect them in courts," the Foreign Ministry said in a statement with regard to the illegitimate arrest of the lawyer Kurbedinov. The Foreign Ministry has also strongly protested against the arrest of Kurbedinov. The statement says that he is one of the key lawyers working on the cases against Ukrainian citizens who have illegitimately been held in custody by Russia on trumped-up and politically motivated charges. Also, since recently he has been defending one of the Ukrainian naval sailors who had been taken prisoners of war by Russia. "It was the latter fact that could have led to his arrest, but this is not the very first case when the Russian occupiers are prosecuting lawyers and human rights activists. In November alone, Emil and two of his colleagues, Lily Gemenji and Edem Semedlyaev, received groundless 'warnings' against the 'inadmissibility of violation of the law on demonstration,'" the statement said. The Foreign Ministry of Ukraine condemns such unworthy practices and calls on Russia to immediately stop them. "Russia must fully comply with the relevant resolutions of the UN General Assembly adopted in 2014, 2016, and 2017, as well as the decision of the International Court of Justice on interim measures in the Ukraine vs. Russia case, adopted in 2017," the ministry said. "We herewith call on the international community to heighten political, diplomatic and sanction pressure on the aggressor country pending Crimea's de-occupation and the release of all the Ukrainians illegitimately held by Russia," the Foreign Ministry said.